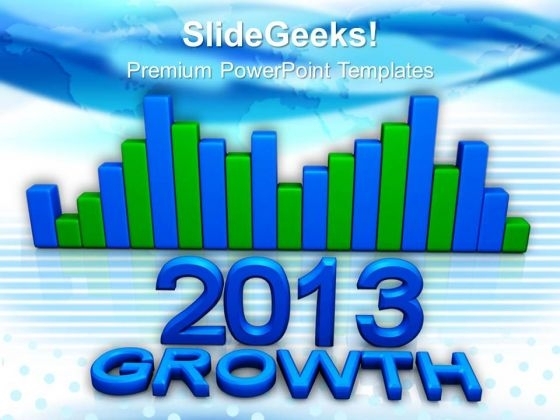 Growth Concept Marketing PowerPoint Templates And PowerPoint Themes 1012-Create stunning Microsoft office PPT Presentations with our professional templates containing a graphic of year 2013 growth chart. This image has been professionally designed to emphasize the concept of business growth. The structure of our templates allows you to effectively highlight the key issues concerning the growth of your business. This image has been conceived to enable you to emphatically communicate your ideas in your Marketing and Financial PPT presentations.-Growth Concept Marketing PowerPoint Templates And PowerPoint Themes 1012-This PowerPoint template can be used for presentations relating to-"Growth concept marketing, business, success, finance, new year, marketing" Crack the code with our Growth Concept Marketing PowerPoint Templates And PowerPoint Themes 1012. Your thoughts will decipher it for the audience. Achieve that festive atmosphere you desire. Festoon your address with our Growth Concept Marketing PowerPoint Templates And PowerPoint Themes 1012.